The Commonwealth Games have Rolled Out of Town and Morven Returns to Familiar Ground. 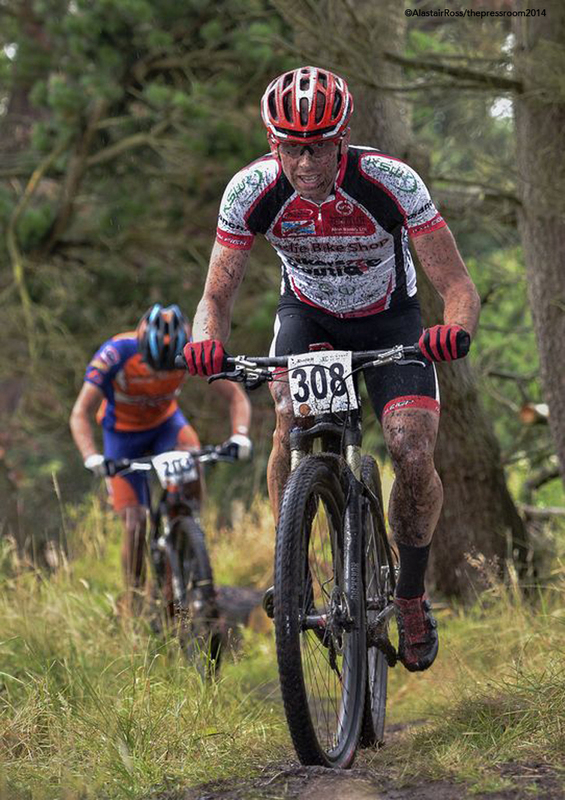 After a long summer break, the SXC returned to action on the 10th of August, taking the show to the Kingdom of Fife. 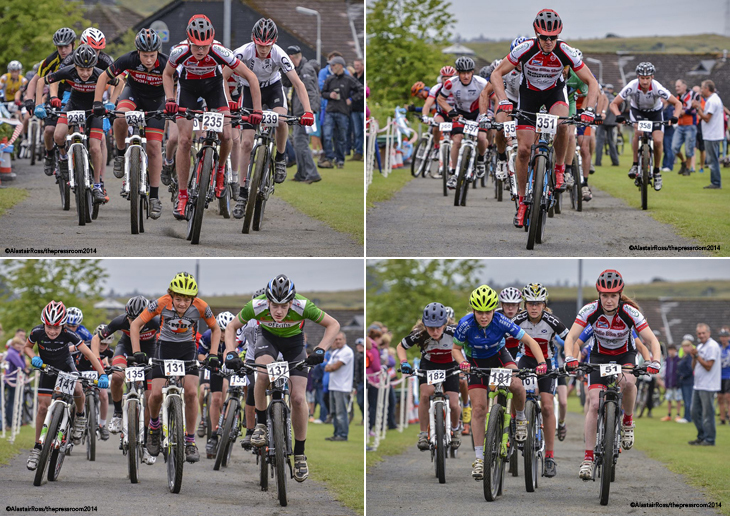 The team at the Meedies Bike Club, coupled with the support of Fife Council had been hard at work for many months to develop a XC course at Lochore Meadows Country Park. The course was fast and flowing, and was highly praised by the racers. Starting off from the wide open field the riders flew out of the arena, much to the delight of the spectators. Climbing up through the dirt jump park, riders were tested on tight, steep corners before a final haul to the top of the hill, all the time dodging the resident herd of cattle. After a short breather, it was time for the descent which was fast, rocky and rooty, with plenty of trees to keep the riders honest. Dropping back down to the lochside, cyclists were treated to copse after copse of tight, rooted and exhilaratingly fast trails. With the arrival of Hurricane Bertha imminent, the first racers of the day lined up on the start, with a wide range of ages and abilities all ready to set off for varying lengths of race. The first event of the day, as ever, goes to the Juvenile Boys, who sprint one flat-out lap of the course. Tim Shoreman (Deeside Thistle) continued his fine run of form to take the victory 25 seconds ahead of Perth City Cycles rider Craig Dobbins and Tam Munro-White (Ben Wyvis CC). Anna McGorum (Peebles CC) completed her lap in 24:07 to win the Juvenile Girls, with Emily Field (Stirling BC) and Megan Wilkinson (Peebles CC) completing the podium. 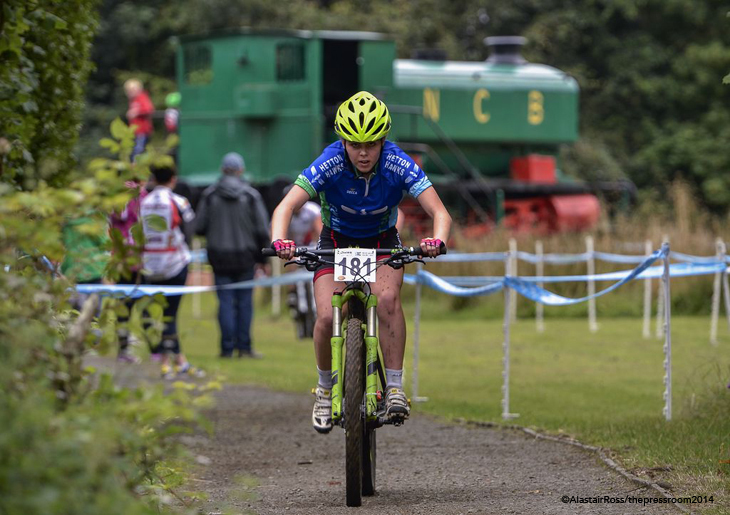 In the Youth Boys competition, Conner Johnstone (Team Leslie Bikeshop) took his fourth win of the season, with visiting rider Calum Fernie (Nottingham Clarion CC) ahead of Perth City Cycles’ Douglas Carcherie. Johnstone also claimed the fastest lap of the morning’s competition with a time of 18:33.034. Anna Kay (Hetton Hawks) was first placed Youth Girl and Louisa Watt (Peebles CC) came home in second spot. The aptly named Jennifer Tough took victory in the Sport Women, with Anne Murray (Team Jewson) winning the Veteran Women ahead of Louise Allen (Mukyriderz). Anne was enjoying the course so much that she even undertook an additional fourth lap to continue her battle with Gillian Pratt (Team Leslie Bikeshop) who won the Elite Women’s race. Challenging each other from start to finish after riding clear of the pack, Mark Barnett (Team Leslie Bikeshop) and ever youthful Gregor Grant (Moray Firth CC) thrilled the crowds with a sprint finish, Grant coming out on top by 0.126 seconds! Brian Garriock (Perth City Cycles) was third. John Newton was another Leslie Bikeshop rider who has won every race this season, and again took the victory in the Super Veteran Men ahead of David McLean (Hetton Hawks) and Eddie Gronkowski (Mukyriderz). Sue Hynd won the Taster Women’s event with a smile on her face, and Steve Field (Stirling BC) was the Men’s Taster victor. By the time the youngest riders of the day lined up on the start line of their specially designed, miniature version of the course, they were feeling the full force of the storm. 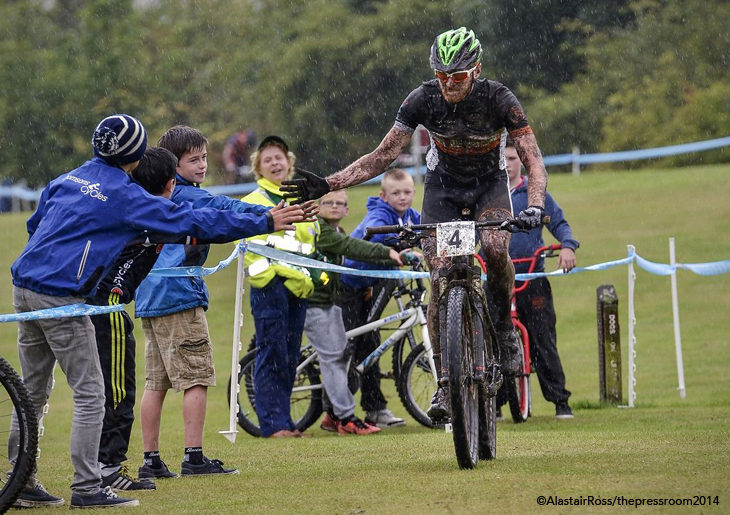 With heavy rain, and lashing wind, these 50 young riders bravely battled on, for the most part, with smiles on their faces. In the Under 8’s race, where some riders totter along on pedal-less balance bikes, Gavin Gronkowski pipped Sandy MacKay to the finish, with Gregor Watt in third place. In the Girls, Heather Wilson finished over 30 seconds clear of Anna Birrell and Rhiannon Gourlay. The Under 10 Boys was a close fought battle, with Ruaridh Johnson finishing just ahead of David Cathcart and Jake Rennie. Emily Carrick Anderson was dominant in the girls, ahead of her teammates Christina McGorum and Holly Hobbs. Her brother, Coran Carrick Anderson again won the Under12 Boys race, ahead of Russell Brown, with Jamie MacKenzie working his way up from the back of the pack to finish third. Elena McGorum saw off her teammate Emily Wilkinson to win the Under 12 Girls event. 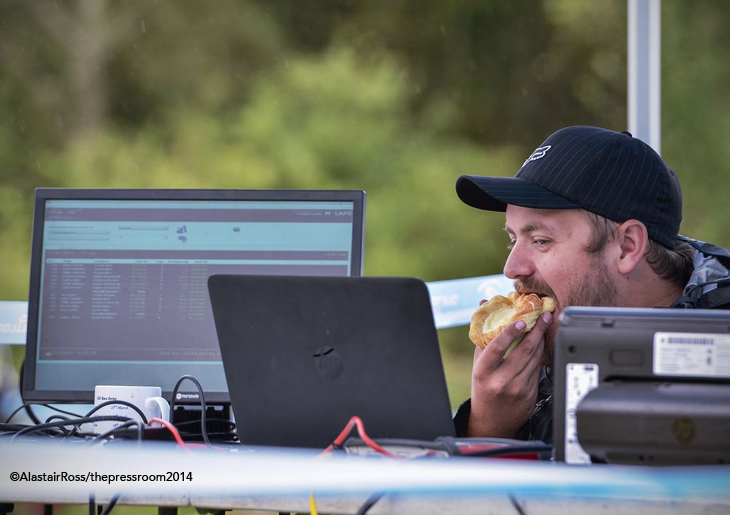 The final events of the day were reserved for the hardiest souls, as the hurricane bore down on the arena, and spectators huddled in the Meedies tent, where the cakes and coffees were going down a storm! 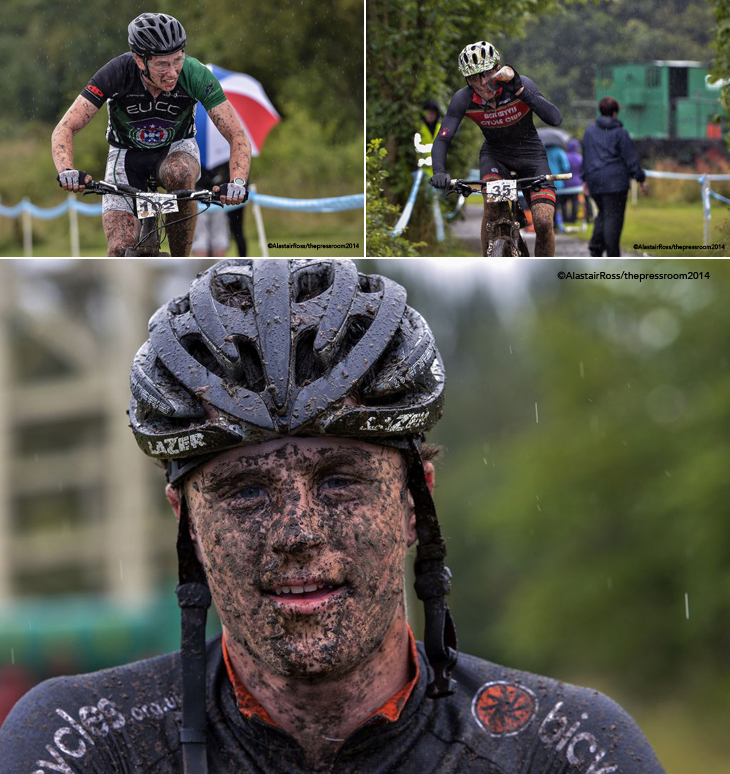 With the Elite Men taking on five laps of the now rather muddy and slippery course, the crowds were poised to see some exciting racing. Mark McGuire took a convincing victory in the Junior Men’s event, sitting with the Elite leaders for the best part of the race. Calum Magowan (Peebles CC) took silver with third place going to Jamie Mason (West Lothian Clarion). In the Sport Men, Michael Bossard toppled series leader Graeme Warren (Velo Club Moulin) to take the win at Lochore, with Stuart Dun (Edinburgh University CC) in third. It was a resounding victory for Scott Logan (TheBicycleWorks) who rode clear of the pack on the first lap. A tasty battle ensued for the remaining podium positions with Trek Concept Store Glasgow rider Derek Shanks taking 2nd place, ahead of a delighted Craig Webster (Mukyriderz). 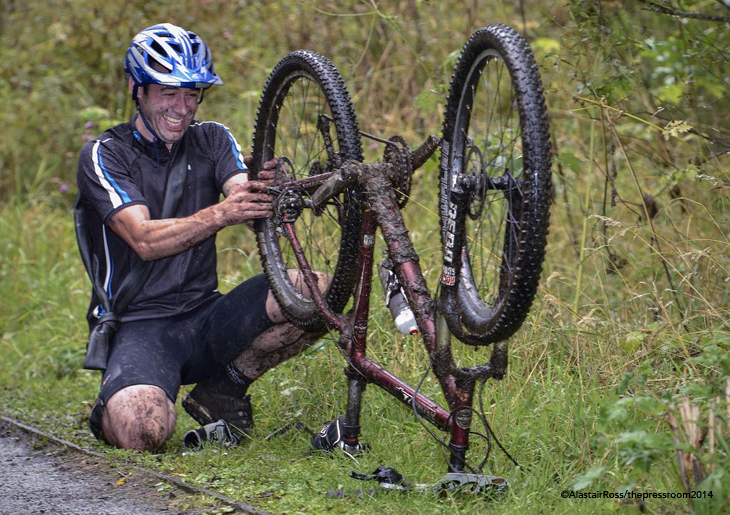 Team Leslie Bikeshop specialise in Veteran men, and Lochore was no exception. Gary McCrae came home over 1:38 ahead of his nearest rival, Greig Walker of Velo Club Moulin. McCrae’s teammate Damien Slorach was third. 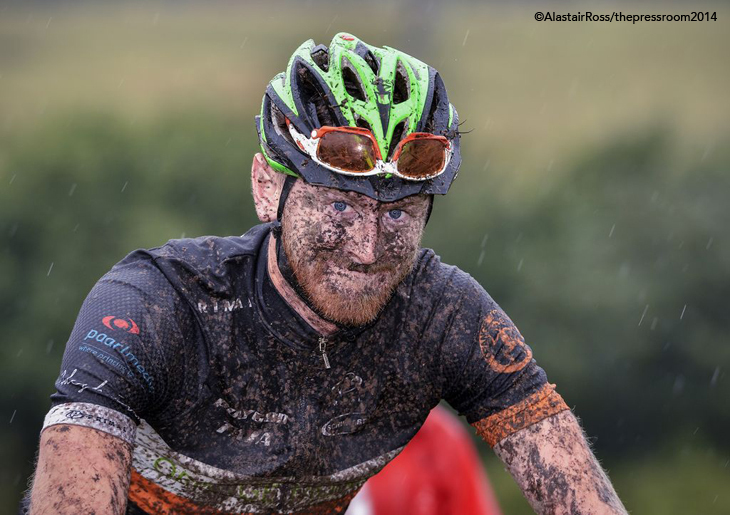 Finally, in the Elite Men’s event, Rab Wardell (Orange Monkey Pro Team) was unstoppable, riding strongly throughout the race to finish almost five minutes clear of his nearest rival. Rab also took the honour of completing the fastest lap of the day’s racing, winning himself a brilliant Garmin device, courtesy of Thomsons Cycles, in the process. 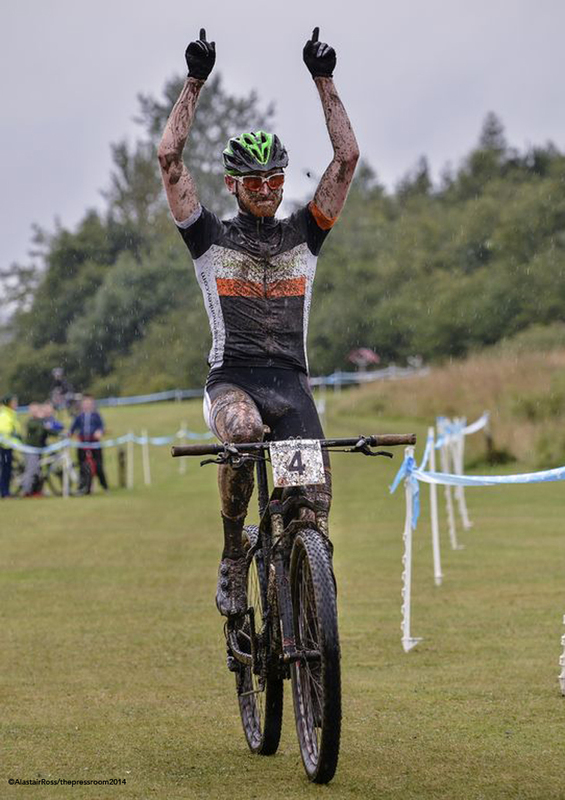 Second place went to Rob Friel (Glasgow Whls), with Dougie Shearer (Innerleithen I-cycles) rounding off the podium. It was an exciting day of racing in all categories, and with rave reviews, the course looks set to become a firm favourite in the calendar. 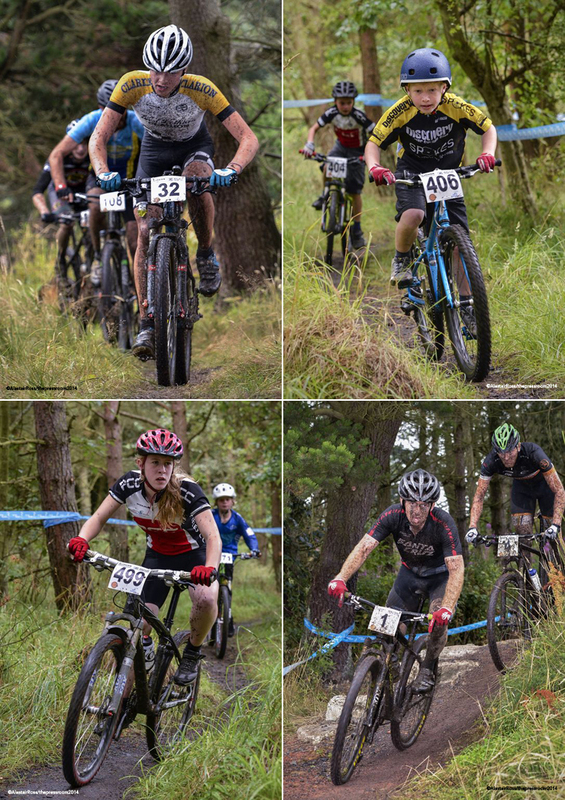 The series culminates in the final round of the 2014 SXC Series and Scottish Championships at Dalbeattie Forest on the 14th of September.